Photos & text about mostly plinthed (on static display) and forgotten South African Steam Locomotives found all over South Africa - These pages seek to promote awareness and appreciation for these once living machines - Main source used to supply the text: Locomotives of the South African Railways published by Struik in 1985 - Authors: Leith Paxton & David Bourne. Thanks to all photographers. Please contact me if your photo is not credited correctly. This locomotive was built in 1949 as works no 26364 by North British Locomotive Co. There is much confusion as to the owner of this locomotive. 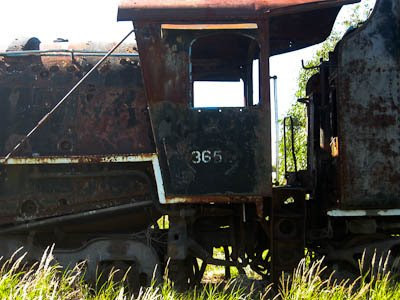 Some say this locomotive is stored here for Transnet Foundation Heritage Preservation. The Class 24 is #3652, which was sold to a sawmill owner (apparently they just wanted the boiler...) , many moons ago, but it was never collected, it has then been claimed back by TFHP. 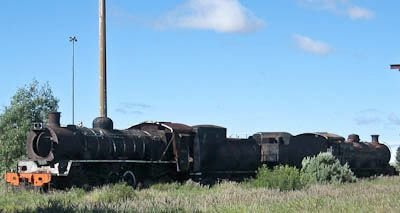 Other reports has it that it was sold to someone from Namibia (South West Africa) in 1984, but the buyer was unable to come up with the funds to move the locomotive. 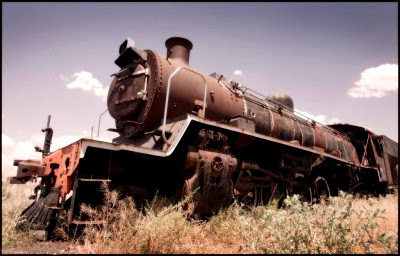 This was a long time ago, and the locomotive is still standing there. The locomotive on the left is #3652. It has a Vanderbilt cylindrical tender. In 1901, Cornelius Vanderbilt III, whose great-grandfather founded the New York Central Railroad, invented a cylindrical tender which was soon adopted by a number of American railroads with oil-burning locomotives. Compared to rectangular tenders, cylindrical Vanderbilt tenders were stronger, lighter, and held more fuel (water in RSA loco's) in relation to surface area. The locomotive on the right is SAR Class 12A N0 2123. Engine number 3652. This number indicates that the loco belongs to the Class 24 - 100 of these were built by North British Locomotive Co. They were numbered 3601-3700. The Class 24 is also depicted on a 25 June 2010 stamp release by the South African Post Office. (SAPO). This image is published here by kind permission of SAPO. The Class 24 is a branch-line locomotive introduced in 1948 for operation on track as light as 40 lb, much of which was laid in SWA (now Namibia). As such this they were intended to displace the old Class 6, 7 and 8 (including the plinthed Class 8F #1236 pictured higher up) locomotives still in service there. The tender is of the "Vanderbilt" or "barrel" type with cylindrical water tank and "Buckeye" bogies. Class 24 engine No. 3652. There appears to be 3 engines in the grave yard - these two standing end-to-end - and in the distance on the left a 3rd loco - this is a SAR Class GO Garratt. Class 24 engine No. 3652. photo: Philip Schedler November 2006: Another view of the locomotive which was posted to flickr. 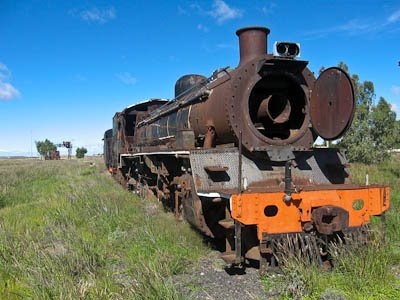 Two Class 24 locomotives are plinthed in South Africa. One is under a roof at Skukuza and the other one is at the Calvinia museum - both are well cared for. photo: Leith Paxton : Click on photo to enlarge: Class 24 2-8-4 - No. 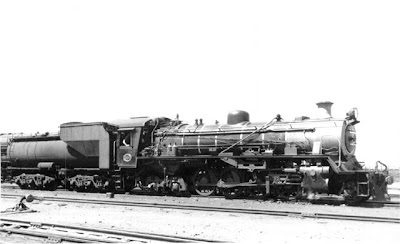 3650 [NBL 26362/1949] - at Sydenham Loco Depot (Port Elizabeth) 13 January 1963. Railways of Southern Africa - Locomotive Guide 2002. compiled by John Middleton. Photos on this page (unless indicated otherwise) were very kindly taken by ds. F. Marais in April/May 2009. NOT WHAT YOU'VE GOOGLED? ...Then Search All Articles in this Blog !! My interest: Local SA & DSWA/SWA Steam Railway History; Please contact me if you can help with relevant corrections, information or photos. Hannes Paling: O&K 10311/1922 ex-Angola sugar est.